Do not give dogs what is holy, and do not throw your pearls before pigs, lest they trample them underfoot and turn to attack you. The Bible has a lot to say about choosing who to share your thoughts with. We can learn a lot about who we should trust when we need to vent, share our hearts, or ask for accountability. While we need to be open and friendly to all types of people, it is also good to be exclusive when you are considering who to confide in. The Internet at large is a bad place to post all the intimate details of your life. While I am a big advocate for God redeeming your story of sin, and I am all about posting the realities of your struggles, you need to be wise about what you share. Things that are unresolved, things that include people who haven’t given you permission to share, and things that you are sharing with the wrong motives are best kept between you, God, and a few trusted friends. It is easy to feel anonymous online, and anonymity is a false sense of safety that may tempt you to overshare. The problem is that these people have no commitment to you, and they have no reason to respect your story. You get the appearance of emotional relief when you unload all of your burdens, but you don’t get the soul-deep peace of actually relying on your relationship with God. Another time it is bad to be too open is when you are in a situation that could lead to sin. If you find yourself alone with someone you are attracted to, spilling secrets has a way of making everything seem more intimate. Not a good combination for avoiding compromising situations. If you have friends that you know are prone to gossip or slander other people, they may also be an unsafe outlet for your heart. As a general rule, if they are willing to talk badly about someone else there is not anything stopping them from doing the same to you. When you are really struggling with something in your life, finding support is a great step toward getting it under control. Pray specifically that God would provide people in your life who are trustworthy to build you up and encourage you to cultivate healthy habits. 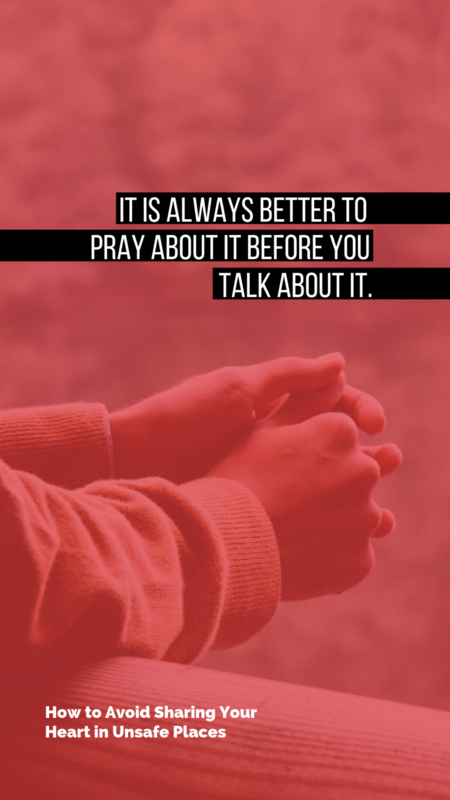 And the best advice-- it is always better to pray about it before you talk about it. The most trustworthy confidant is Jesus. Cast all your cares upon him, because he cares for you. Want to read two FREE sample chapters of Rend Your Heart & Not Your Garments?